Things are up and running again, not as good as before, but enough to bring food to the table. I manage to work on the project for about an hour a day for now, so progress is starting to be steady. Before starting with area 4, I´m changing the layout of some parts of area 3. Specially the lower parts. 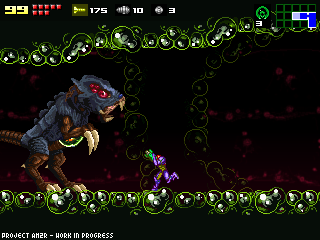 Many Metroid fights are too cramped, so I´m making slightly larger rooms for more exciting Gamma fights. I´m also editing all the Zero Mission based tileset to remove the black outline, so they merge much better with the background. The outline really helps in a handheld screen, here it looks quite cartoony. I´m recording some material from the original game, and some unseen parts of AM2R to create a new trailer. If everything goes well, you´ll be meeting the Gammas on the next update. I want to thank all the great people that understood this last delay, I really appreciate your support. Good job, continue working as you can. The best things in this live comes at the end. Awesome work. I'm amazed at your drive to get this project done. Most projects like this end up as unfinished WIP's. Keep up the incredible work. Indeed. We should be thanking you. We're with you all the way, Doc. Glad to see an update! And also glad you've been able to put food on the table lol. My business has been rather slow lately too and it's been tough but we need to just hang in there basically. Well good luck on the project and hope to see the next update soon! Glad to hear things are going well and the project is alive and progressing! So many projects are started and never finished, I can't tell you how satisfying it is to read you're still at it. Thanks for all your time and hard work! Looking forward to the game! I am happy to see another date, I check here daily hoping to see something new, And I am ecstatic to hear that work as begun to normalize for you. If you need donations at all to keep this going, and have paypal, Please, drop me an email at saylsen17@gmail.com. As always, I can't wait for the final production of this wonderful game. -Bobsam-Two words Doc. Thank you. Glad to see you're able to come back to the project. Can't wait to see the new trailers! Keep on truckin! Still looks great. glad you're back to normal. i am looking forward to the next update. hm.. i looked at the before and after picture and could not see any difference... does this mean my eyes arent trained to compare things like this?? Good to see that things are getting better. I think that without the outlines, the whole scene looks 10 times better! Kudos! i like the after pics. the missing outline really makes a difference. congrats! Suerte con el trabajo y que el juego siga adelante! No need to thank us. Your the one putting in countless hours of your time making this a great remake! And things look much better now that the black outline is removed. Blends much better like you said! Good stuff Doc! The videos are your best signs of updating. That proves that you're really working hard at making a wonderful game! Anyone can send in screens saying they've done something, but a video shows that you put actual life into the game. But now your back and this is great! Do the best you can and impress us with your new trailer! Great to hear youre up and running again! I couldnt live ewith the thought the project might be dropped. And we should in fact thank you, like everyone else said. Nice work man. I really admire your drive and determination for such an extended project with so much potential. Actually, ZM uses red outlines most of the time. I don't know how you got black ones out of them, but red is a much better colour for the outline than pure black. Even really dark brown is works good. I wouldn't remove the outlines, or the fact that they have a different color than the tiles themselves, because that is the one thing that gives ZM it's unique style. It's like how in Zelda:LttP, they gave Link pink hair, and very simple shading. It adds a tiny bit of uniqueness to the sprites. Of course, this game isn't ZM, and I can admire you for wanting to add your own twist to it, making it what you want it to be. Looks good. Not sure if removing the black lines was really necessary, but sometimes it's the little things that really make a game. Keep up the good work and glad to hear business took a turn for the better. I hope things keep getting better for you. The bad economy can't last forever. Thanks for not forgetting about this project despite all of that--we're really looking forward to it. Removing the black outlines was a good call. Keep up the good work! Haha! Good to see you pulled through. Ever since your last couple of videos, my hopes for the progress of this project shot straight through the roof, and I'm glad to see you're still going strong. Keep it up. I still keep clicking the link almost instinctively. The anticipation keeps building. This is awesome, to put up so much effort into making a game ,which we haven't seen in a long time, being remade into a whole new mechanic and visual style this truly shows your enthusiasm for Metroid. I'm a huge fan myself and this is a game I almost had forgotten all about but you've managed me to pick it up and play it through again. Looking forward to the final version of the game and I'll be keeping an eye out for all the updates coming. :D Cheers from Sweden! I'm rooting for you 'till the end! Btw thank you Doc for your great support! My blog became alive! It was empty for several months. I lost my hope but when I found comments on my page I was amazed! So now I gonna keep it updating monthly as you. Cheers, you really help! i hope i here from you soon. thanks for getting abreast of news about the project. we are sure to be a great success! I congratulate you for continuing to work consistently and for taking time to carry out the project. we soon see the gamma metroids in action! forward! gracias por ponernos al tanto de las nuevas noticias sobre el proyecto. estamos seguro que sera un gran exito! le felicito por seguir trabajando constante y por darse el tiempo para realizar el proyecto. queremos ver pronto los metroids gammas en accion! adelante! wow, it looks amazing! i'm waiting for updates. Congratulations, Doc.! Dude, I cannot wait for this! Nintendo isnt making any games cus the wii gave them so much money, there taking a break! There not even planing any games! If they shut this project down, we must all send mail to nintendo and give them a pice of our minds! Ant, that was really not an intelligent comment. I'm sorry, but it really needed to be said. You're doing well, Doc. Keep up the good work, whittling away at it when you get the time. is this for pc or somthing else? Be it 5 or 10 minutes a day, a progress is still a progress. Keep up the good work, we really need it, man! Cheers again! -Bobsam- You should make two modes you can play on one with the outlines and one without the outlines. When do you think nintendo will relesse a new metroid...? 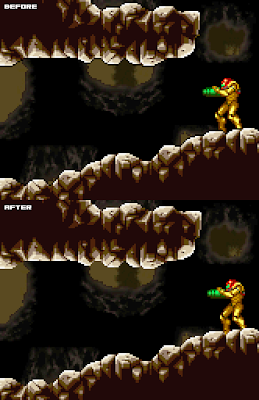 Heck, do you think there even thinking about another metroid? Least weve got doc. this looks awesome!, i was wondering if this is computer only of if it's possible for it to come to gameboy advance or Nintendo DS, but just wanted to say great job on the remake.